Peter Bourjos is expected to provide a defensive upgrade in center field -- if he wins the job this spring. ST. LOUIS — Peter Bourjos couldn’t stop smiling Monday. One of the newest St. Louis Cardinals, Bourjos was practically beaming as he got his first taste of the experience that is the Cardinals’ annual Winter Warm-Up, signing autographs for two hours in the morning and then meeting with the assembled media. This was all new for the speedy center fielder after four seasons in Anaheim and eight years in the Angels’ system. He heard his name mentioned in trade rumors for three years and didn’t think he’d be back in LA in 2014. Less than a month after watching the Cardinals play the Red Sox in the World Series, Bourjos was sent to St. Louis with minor league outfielder Randal Grichuck for David Freese and Fernando Salas. "Obviously, I was a little disappointed leaving Anaheim, but things haven’t gone well the last couple years there," Bourjos said. "I was banged up last year and I didn’t play in 2012 after I played and had a pretty good year in 2011. So coming here and having an opportunity just to get out there and prove what I can do was nice to hear." Bourjos, 26, heard plenty about St. Louis from one of his LA teammates, Albert Pujols. "He said it’s awesome," Bourjos said. "He said I’m really going to enjoy it. He called me the day I got traded and he was really happy for me. 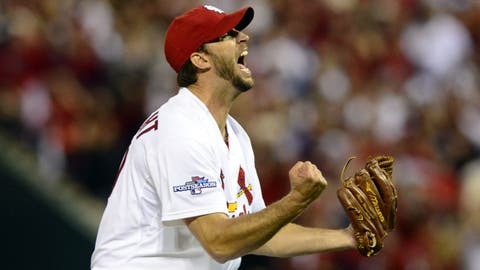 He couldn’t say enough nice things about playing in St. Louis in front of the fans and the town and everything." Bourjos is ready to experience it firsthand. If given the opportunity, he probably would have put on a uniform and started running around the outfield grass at Busch Stadium when he visited around Thanksgiving, even though it was 18 degrees and snowing. "I’m really excited about it," he said. "I was excited when I got the call, and I can’t wait for spring to start the season." For him, the trade represents a fresh start with a new organization and a chance to show what he’s capable of. What that is exactly is kind of a mystery at this point. We know he is regarded as a strong defensive player and that he’s fast, as evidenced by his 11 triples in 2011 and his 22 stolen bases that same season. But when he steps to the plate for the first time with St. Louis, he’ll be doing so as a career .251 hitter with a .306 on-base percentage and .398 slugging percentage after 1,136 major league at-bats. He logged more than 200 plate appearances in only one of his four seasons in LA. That was in 2011, when he had 552 plate appearances over 147 games and batted .271 with a .327 OBP and .438 slugging percentage. He had 26 doubles, 11 triples, 12 home runs, 43 RBIs, 72 runs scored and 22 steals. "I’ve never walked a lot, so I can’t say I’m an on-base guy," Bourjos said. "I think I’m more of a gap-to-gap hitter. I’m an aggressive hitter. I don’t inherently draw a lot of walks. I never have in the minor leagues, so I don’t think it’s good for me to go up there trying to walk because it’s not one of my strengths. I think when I’ve had success it’s when I’m up there trying to drive the ball in the gap and stay up the middle and be aggressive." Bourjos said his legs feel good this off-season. He wants to run — an approach that will melt the hearts of Cardinals fans who long for the days of Vince Coleman and Ozzie Smith swiping bases. "I’d like to be in the 40s (in steals), obviously, but it’s all about how you are swinging the bat, if you’re getting over there consistent enough to steal bases," Bourjos said. "I think in the minor leagues I had a season where I stole 50 bags and then a lot of seasons where I was in the 30s. So, hopefully, in the 30 to 40 range. That would be nice." He has yet to discuss his role with his new manager, Mike Matheny. "He just said come to spring training ready to have an opportunity to play and win a job and that’s all I can expect," Bourjos said. "I’m not expecting him to tell me that I’m the starting center fielder. If I’m coming in late innings in the eighth or ninth for defense or to bunt or to pinch run, I’ll be happy with that as well. I just want to help the team win." "We just go out and watch him play, see how he fits, see what kind of opportunities he takes advantage of. Give him an opportunity in the spring, like we do with everybody. Go out and show what you can do. We give guys green lights. We give them opportunities to really push the bases. We push them to do whatever they can in the outfield, to show their talents and show their skills. That’s the opportunity he’s going to have."